In the northern region of India lies an undisclosed land nestled in the lap of Himalayas-Sikkim! Bestowed with sublime natural beauty and rejuvenating climate, Sikkim is among the most-sought after destinations among travellers from all corners of the world. Besides being a hot-spot for nature lovers, the state is one of the favourite spots for trekkers, India. As you pass through the valleys, the magnetic beauty of the marvellous mountains unfolds before your eyes. The sense of crisp and fresh air lingering in the surroundings of Sikkim while trekking is just fabulous. The place is endowed with many trekking routes and trek to Kangcendzonga is known to be the most challenging of all, but provides an excellent opportunity to explore the amazing vistas of nature in its best form. 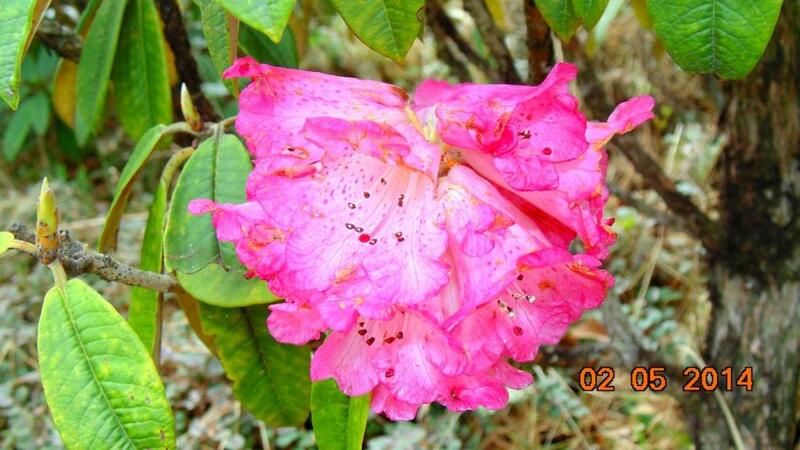 Another easy yet short trek in Sikkim is the Barsey Rhododendron Sanctuary, which is also home to hemlock, silver fir, rhododendron and Magnolia. The place is having a myriad of flora and fauna available here, including the elusive Red panda. The place aptly named the valley of flowers. You can always combine this as a planned trip to West Sikkim or make it a short duration trip targeted only for Barsey, we choose the former one and used a short holiday weekend in the week of 30th April to make the trip. An uneventful overnight journey from Kolkata brought us to Siliguri the next morning. This time we took the help of tatkal ticket as last minute planning meant that there were no reservations easily available on overnight trains from Kolkata. Our vehicle stop for the day was Hilley, which is about 151 Kms from Siliguri via Melli, Jorethang, Darmdin and Sombaria. Within 10 minutes after we leave Siliguri, our road starts moving along with river Teesta. Teesta is the biggest river in Sikkim, and is actually pretty small in comparison with the rivers of North India. It is a typical Himalayan river which has enough water all through the year, sourced from the rains for half the year, and from melting ice for rest of the time. It offers great views, flowing in zig-zag fashion in its valley, where our road slowly starts climbing uphill. All the way, the jeep ride is very enjoyable with good views alongside the hilly roads, with some hanging bridges and Teesta flowing near the road. After reaching Hilley, we started leaving footprints towards Barsey. Barsey is still categorized as an offbeat destination with less tourist traffic, sandwiched between the Singalila National Park in the south and Khangchendzonga Biosphere Reserve in the north, this small 104-sq-km sanctuary is at an altitude of 10,000 ft and supports a wide variety of bio-diversity and being a Trekking zone, has to be reached on foot. From the sanctuary gate at Hilley, it is a 5 km trek inside the reserve. We paid and got our permits for the reserve from the sanctuary entrance gate and started the walk. The destination was Guras Kunj, which is a trekkers hut 5 KM inside the reserve. 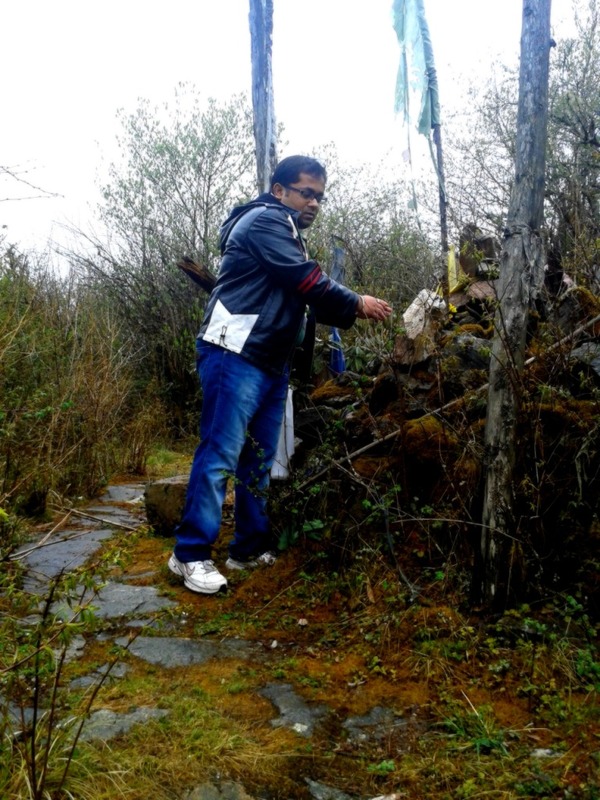 The trek is very easy and not steep at all, we gained about a 1000 Ft in 5 kms . It is really a fairly easy walk that can be done in 2 hours or less. The beauty was spellbinding and we thoroughly enjoyed our first experience of a trek through the colourful Rhododendron forests. The flowers dot the entire route and made it a fairytale walk. The whole forest is ablaze with riot of Rhododendron Flowers. The back drop of the mountains is truly a mesmerizing experience and walking under these colourful canopies is an otherworldly experience, to say the least. Our accommodation was a trekker’s hut- Guraskunj (Guras means Rhododendrons) at Barsey. It was entirely made of stone and the interior is wrapped by wooden structures. No electricity, no mobile tower, situation had made Barsey more wild, more natural. As it was already half past Five at the evening with 2 to 3 degree Celsius temperature and unclear sky, we therefore confined to the trekker’s hut. There were other groups of trekkers also and we spent the evening at the kitchen warming our hands in front of the fire and having pakodas and tea at regular intervals. We missed the view of the almighty Kanchenjunga as the sky was not clear and kept on praying that at least we can have a view at morning. At around 8 pm, we started off with dinner. After the long tiring day, we could not have been hungrier. The Sherpa had prepared excellent food-dal, rice and chicken that we hogged eagerly. We finished the day and retired as early as 9 PM after the dinner. Early in the morning, around 6am, we heard loud noises and wakeup call from one of my friend. As I opened my eyes, he rushed into the room and shouted at us to wake up and take a look at the amazing views of Kanchenjanga and hurried back with his SLR camera. We rushed out and saw some people gathered, looking and capturing photos. And so I look around – and what a great view had I woke up to! Standing there, tall and snow-clad was majestic Mt.Kanchenjanga and surrounding peeks shining in the sun covering more than 150 degrees of the horizon. Together with ridges running roughly from east to west they form a giant cross. These ridges contain a host of peaks between 6,000 and 8,000 m. On the east ridge is Mt. Siniolchu and Mt. Pandim. The west ridge culminates in the Mt. Kumbhakarna with its imposing north face. To the south are Kabru North and Kabru South. That was the first time ever that I was getting to see a Himalayan mountain and I suddenly felt that travelling a few hundred kilometres was worth the effort. Clouds and sunshine were fighting each other to kiss the mountain top in the early morning. It lasted only for around 15 minutes when the clouds decided we had enough of the great view. We then continued our preparation for the tough day ahead. The destination was Guras Tal which is 5 km trek from Guras kunj and at an altitude of 10500 ft. The trail seemed to be taken by few. Route was straight up and steep inside the jungle with lots of Floras. Every now and then there were streamlets on the trail making the boulders slippery and unstable. At times we were frightened to find unavailability of light on ground as gigantic trees spread their tentacles so wide that even sun cannot penetrate through it. The dramatic appearance of fog made the atmosphere more eerie. As we proceeded, we started leaving trails between the Rhododendrons flowers of various colours. About the Rhododendrons, Hugh and Colleen Gantzer, the renowned travel writers have said "We, in Uttaranchal, are proud of our Valley of Flowers, but here it was'nt just one valley, it was entire hillsides after hillsides after hillsides we have marvelled at the famed wild flowers of the Swiss Alps but they paled into insignificance when compared to valley of flowers of Sikkim."
. The trek has paved a stepping stone to my next trek at Gochala (Kanchenjanga base camp) which I am planning next year with my office colleagues. | Love for the rain, again ..
Nice Travelogue Sourabh . We also did the same Barsey Guras Taal Trekking 2 years ago & got those amazing views of Kanchenjunga from Guras kunj . Enjoyed a lot .. If possible, please add some photos also. sorry, I have posted in the wrong forum. Re-posting it to the correct forum "Sikkim" along with photographs. I can see that you are trying to post photos again. Which browser are you using? In that case. Upload the images that you want into your IndiaMike gallery. I can see that you have already put a couple of pictures there. Paste in the Image URL. make sure that the 'http;//' is not doubled at the start of this. Try the Rhododendron photo and see what happens. You can put ten images in a single post. Don't forget to add some caption or commentary so people know what the subject is. Will you please post the contact number for booking Guras Kunj?